Students entering South Plains College are encouraged to file a degree plan with a program advisor and complete the specified requirements for an associate degree or certificate. Students intending to transfer should consult the catalog of the transfer college or university and plan their prescribed elective courses to meet the special requirements in the curricula of these schools. Advisors are available to help the student plan a college course of study to meet specific degree requirements at the transfer university. Candidates for the associate degree must complete at least 15 semester hours of general education courses and meet competency levels in written communication, mathematics, oral communication, and computer skills. 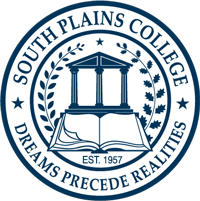 Candidates for graduation must have a cumulative grade point average of at least 2.00 (“C”) in course work completed at South Plains College. In order to be awarded a certificate you must complete all program course requirements and have a cumulative grade point average of 2.00 (“C”) or better. Grades in courses not applying to the certificate may be waived by petition if approved by the Program Advisor, Instructional Division Dean, and Vice President for Academic Affairs and submitted to the Dean of Admissions and Records. The waiver of grades as indicated above will not entitle a student to graduate with honors based on the certificate GPA. Candidates for graduation must be in good financial standing with the college. Candidates for graduation must meet TSI requirements as described in the next section. As required by the State of Texas, students who elect to complete the requirements for the Associate of Arts, Associate of Science, Associate of Arts in Teaching, Associate of Applied Arts and Associate of Applied Science degrees must take the TSI Assessment test and demonstrate college-level proficiency in reading, writing and mathematics. This standard also applies to students who elect to complete the requirements for the Certificate of Proficiency in programs which comprise 43 semester credit hours or more of study. Students who score below minimum passing standards on any of the three portions will not be permitted to enroll in courses that correspond with the subject matter for which the minimum score has not been achieved. In addition, enrollment in specific college level courses may be restricted until all sections of assessment indicate mastery. Completion of developmental study courses do not apply toward graduation. A degree cannot be awarded unless all TSI requirements are completed and met. Complete 42 semester hours of SPC core curriculum. Candidates for graduation must complete a minimum of 60 semester hours of college credit. All courses applied toward the degree must be eligible for transfer toward a baccalaureate program as listed in the Lower Division Academic Course Guide Manual. Candidates for graduation must complete at least two semester hours of non-repeated physical education activity courses. Students completing the majority of their degree requirements at a South Plains College Extension Center or via internet instruction can substitute PHED 1304 Fitness and Wellness to fulfill the physical education core requirement. Veterans presenting their DDR-214 discharge will receive two semester credit hours toward the physical education degree requirement. Candidates for graduation must complete at least 25 percent (minimum 16 semester hours) of work in residence at South Plains College. Any student who completes 42 semester hours of college level credit, has at least 25 percent of degree requirements (minimum 15 semester hours) in residence at South Plains College, and lacks only 12 semester hours or less to meet the total semester hours required for graduation may accomplish the remaining semester hours in another accredited college. The student may then transfer those semester hours back to South Plains College for completion of graduation requirements. College-level credits from regionally accredited colleges and universities are accepted in transfer, but only those courses with a recorded passing grade are acceptable toward fulfillment of graduation requirements at South Plains College. A candidate for any degree must meet the requirements as set forth in the catalog for the year of first enrollment, as long as enrollment is continuous, unless he or she elects to graduate under the requirements of the current catalog. To qualify for a second degree, a student must complete an additional 18 semester credit hours in residence at South Plains College for the second degree and apply for graduation. All courses applied toward the degree must be eligible for transfer toward a baccalaureate degree as listed in the Lower Division Academic Course Guide Manual. Candidates for graduation must complete all prescribed entrance requirements for their major program of study. Candidates for graduation must satisfactorily complete the specified course of study for the declared major. Candidates for the Associate of Applied Arts and Associate of Applied Science degrees must complete 60 semester hours. Candidates for graduation must have completed at least 25 percent of required course work (minimum of 15 semester hours of college-level credit) at South Plains College. To qualify for a second degree, a student must fulfill the residence requirements (25 percent of the required course work, usually 15 semester hours of college-level credit) for the second degree and apply for graduation. Candidates for the Certificate of Proficiency must complete the prescribed number of semester hours up to a maximum of 51 semester hours. Candidates for the Advanced Technical Certificate must complete the prescribed number of hours in addition to completing all requirements for the Associate of Applied Science or Associate of Applied Arts degree. Candidates for the Enhanced Skills Certificate must complete the prescribed number of hours up to a maximum of 12 semester hours in addition to completing all requirements for the Associate of Applied Science or Associate of Applied Arts degree. Candidates for graduation must have completed at least 25 percent of required course work at South Plains College. To quality for a second certificate, a student must fulfill the residence requirements for the second certificate and apply for graduation. Candidates for graduation should make application for graduation by contacting the Admissions and Records Office or click here. Deadline for application is November 1 and March 1 of each year. There is no application fee. Students who wish to replace a diploma that has been awarded will be charged a fee of $25 cash or money order, and must complete the required form. Must have completed at least 45 college-level semester hour credits at South Plains College when an application for graduation is submitted. Must be either enrolled at South Plains College in a course of study that would complete all specified program requirements or be able to complete them during the succeeding summer session. Must have completed at least 10 college-level semester hour credits at South Plains College when an application for graduation is submitted. Students who raise their GPAs as a result of spring and/or summer semester grades, and therefore qualify for honor student status, will have the accomplishment noted on their final academic record. The honors eligibility will be based on your final GPA at the time of your graduation application. Degree plans initiated under requirements set forth in a college catalog more than six years in publication must be evaluated. The instructional division will determine the extent to which semester credit hours previously earned will apply to degree requirements listed in the most current catalog. Transferability means acceptance of credit toward a specific major and degree at a specific institution. These three components must be identified by the student during the application for admission process prior to the first semester of enrollment at South Plains College. Transferability refers to courses in a written transfer degree plan filed in a student’s file in the Office of Admissions and Records. Only college-level courses with Community College Lower Division Academic Course Guide Manual approval numbers are included in this guarantee. If all the above conditions are met and a course or courses are not accepted by a receiving institution in transfer, the student should notify the Dean of Arts and Sciences at South Plains College so the Transfer Dispute Resolution process can be initiated. If course denial is not resolved, South Plains College will allow the student to take tuition-free alternative courses, semester hour for semester hour, which are acceptable to the receiving institution within a one-year period from granting of a degree from SPC. The graduate is responsible for payment of any fees, books or other course-related expenses associated with the alternate course or courses. The graduate must have earned the Associate of Applied Science degree or Certificate of Proficiency beginning May, 1992, or thereafter, in a technical program identified in the college’s General Catalog. The graduate must have earned the Associate of Applied Arts degree beginning May, 2001, or thereafter, in a technical program in the college’s General Catalog. The graduate must have completed requirements for the Associate of Applied Arts and Associate of Applied Science degrees or Certificate of Proficiency with the South Plains College System, with a minimum 75 percent of credits earned at South Plains College and must have completed the degree or certificate requirements within a five-year time span. Graduates must be employed full-time in an area directly related to the area of program concentration as certified by the appropriate division dean. The employer must certify in writing that the employee is lacking entry-level skills identified by South Plains College as program exit competencies and must specify the areas of deficiency within 90 days of the graduate’s initial employment. The employer, graduate, division dean, job placement counselor, and appropriate faculty member will develop a written educational plan for retraining. Retraining will be limited to 12 credit hours related to the identified skill deficiency and to those classes regularly scheduled during the period covered by the retraining plan. The graduate and / or employer is responsible for the cost of books, insurance, uniforms, fees and other course related expenses. A student’s sole remedy against South Plains College and its employees for skill deficiencies shall be limited to 12 credit hours of tuition-free education under the conditions described above. Activation of the Graduate Guarantee Program may be initiated by the graduate by contacting the appropriate Instructional Division Dean within 90 days of the graduate’s initial employment.